We Seal It was established in 1994 and has successfully sealed thousands of homes in the Phoenix metropolitan area, ranging in size from 900 to 20,000 square feet for the past 21 years. We Seal It is not a pest control company. We Seal It is a construction company, licensed bonded and insured. We Seal It is a general contractor, remodeling license ROC#214018 and has over 35 years experience in the construction field. We Seal It specializes in sealing homes. Our construction expertise on how homes are built enables us to identify the problem areas where pests and rodents infestation could possibly occur in the home. The construction / building of a home consists of hundreds of different pieces of material. Due to this process, it is nearly impossible to prevent leaving some entry points open. We Seal It provides a safe and easy way to seal new and existing homes and is chemical free. We specialize in sealing voids and cracks to keep out pests such as scorpions, mice, rodents and spiders. 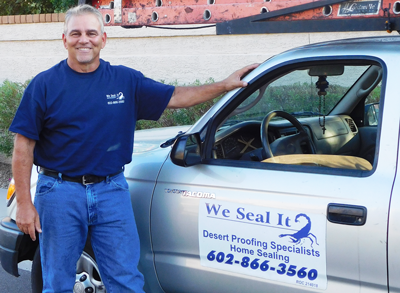 Our desert proofing program consists of sealing the exterior and interior of your home. With this program, we can make your home up to 95% effective is stopping rodents, scorpions and other pests from entering your home! We service homes in the greater Phoenix area, including Scottsdale, Mesa, Gilbert, Chandler, Ahwatukee, Anthem, Cave Creek, and Glendale, Peoria, Surprise and Fountain Hills.